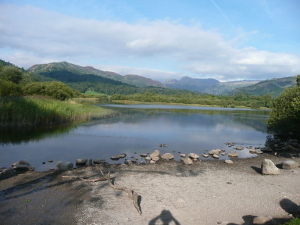 We will leave Rydal Hall immediately after breakfast, preferably by 0900 and drive to the car park at Elterwater. This is free if you are displaying a National Trust Badge. Just outside the car park there is a toilet for which you have to pay. After an easy bit of road walking, we have quite a climb on a rough surface. Once we have reached the top, most of the walk is easy. We have an undulating stretch, before descending to Colwith Force. The last bit of this descent is awkward, and some members of our party might need help. We then have another undulating stretch to Skelwith Force, from which the return to Elterwater is on a well-surfaced easy riverside path. Click for a map of the walk. Elterwater has a pub and a café, as does Skelwith Bridge which you passed on the way to Elterwater. We have no specific plan for the afternoon. For ideas, click on the Afternoons button. Dinner will be at 1845, followed by ???? ?.